Many animals must move to other locations during the year to avoid cold weather or to find food. 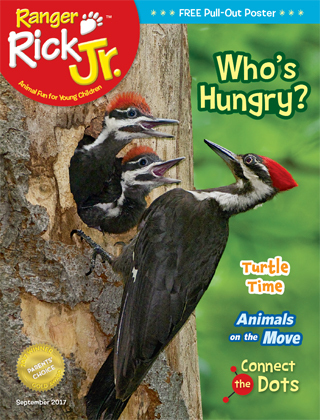 This month’s Ranger Rick Jr. has three examples of animal migrations on pages 24-29 for you to share with your child. • Young children will see that geese fly, wildebeest walk or run, and whales swim. What do we do when cold weather arrives? • We have houses or apartments that keep out the cold, wind, rain, or snow. • We stay warm when we go outside with jackets, hats, and gloves. How far do we have to go to get food during the year?• We may walk to the corner market or drive to a grocery store. While playing the “Get Moving” game on pages 30-31, talk with your child about other animals that migrate—salmon, monarch butterflies, caribou, and different birds. You can help your child appreciate the challenges that some animals endure to keep warm and to locate food. Comparing animal behavior to humans helps children learn about nature. Enjoy reading Ranger Rick Jr. and encouraging your child to appreciate nature.